Valentinian, his pearl diademed and draped bust right. Roma seated facing, her helmeted head left, holding globe and spear. (Theta) in left field, (Phi) over K in right field. 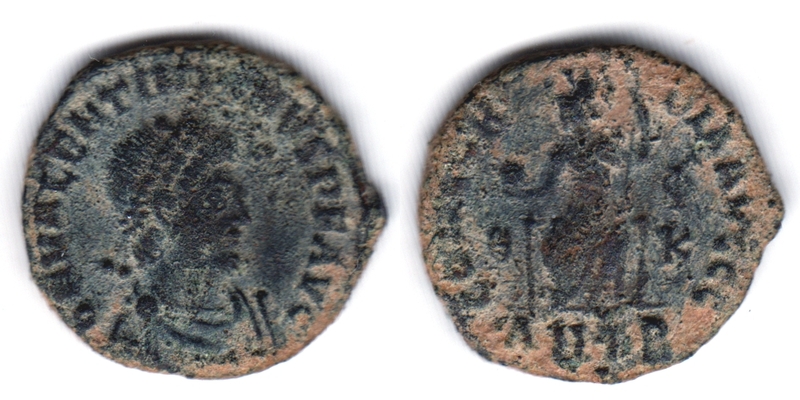 Minted at the 2nd officina (B) in Antioch (Antakya, Turkey) between 9 August 378 and 25 August 383 A.D.
Pearce, J.W.E., "Roman Imperial Coinage", Volume 9 (RIC), Antioch, p285, nr 45b2. Carson, R.A.G., Hill, P.V., & Kent, J.P.C., "Late Roman Bronze Coinage" (LRBC), Part II, p101, .nr 2696.
hinterlassenen Sammlung und Aufzeichnung des Herrn Paul Gerin" (Voetter-Gerin), Antiochia, Valentinianus II, p57, nr 10. Cohen, H, "Descriptions Historique des Monnaies frappees sous l'Empire Romain" (C), Volume 7, p139, nr. 9. Van Meter, D., "Handbook of Roman Imperial Coins", p311, nr 36.